Xert’s Adaptive Training Advisor (XATA) uses advanced analytics to not just model your current fitness, but to individually prescribe workouts guiding you towards a desired fitness and time. I relied on it for >90% of my training this winter leading up to April’s gravel season. Earlier this year, I provided an overview of the Xert Adaptive Training Advisor (XATA) that ws launched by Xert late 2017. Since I love nothing better than using myself as a test subject, I put XATA to the test by using it to plan my training throughout the entire 2018 to date. Training needs to be progressive, steadily building upwards from a solid aerobic foundation to become more and more specialized towards your target event and its specific demands. With Xert, I set my target event date to April 29 for the 25th running of the Paris-Ancaster gravel race. XATA then sets up a template of a 45 day “Base” phase, 45 day “Build” phase, and a final 30 day “Peak” phase. Here is overall fitness progression from January 1 to Paris-Ancaster on April 29th. Yellow dashes = Threshold Power; Black line = Training Load; Purple bars = daily Xert Strain Score; Coloured Circles = Breakthrough Activities. I started systematic training on the bike again in mid-December, following a 6 week break (3 weeks totally off and 3 weeks cross-training). As you see from the progression chart, my Training Load at the start had dropped down to 50 (2 out of 5 stars), while my starting fitness signature was 1010W/17.5kJ/228W for Peak Power (PP), High Intensity Energy (HIE) and Threshold Power. Lower Threshold Power (LTP), an indication of sustained endurance power, was 184 W.
Note also the pretty close matching between Training Load and Threshold Power. That is one reason why Training Load is often used as a surrogate of overall fitness. During the Base phase, XATA focuses on building up aerobic capacity, prescribing a variety of endurance workouts that aim to raise both LTP and TP. By the end of January and Base phase, with every ride done on the trainer due to the harsh Canadian winter, my LTP and TP rose to 199 W and 242 W, respectively, while my Training Load increased to 77 (3 out of 5 stars). Graph of my Peak Power (green), High Intensity Energy (blue), Threshold Power (red), and Lower Threshold Power (grey) from January 1 to April 29. TP generally changes gradually, whereas PP and HIE can spike up and down more. In Build phase from February to mid-March, XATA began prescribing workouts of some intensity 1-2x/week. In keeping with my desired focus of 6-min power and my fitness level of 3 stars, these intensity workouts were primarily 3-3.5 stars in difficulty, and with the focus of 8-10 min power to build me gradually towards my 6-min power focus. By the end of Build phase, my Training Load had increased to 92, while my LTP moved up to 208 W and my Fitness Signature to 1031W/18.6kJ/254 W.
The 'smart' Closer 140 workout that was a staple of my Build phase. It's 'smart' because the wattage constantly changes to keep you fatiguing at a set rate, recognizing that your ability to generate wattage decreases as you fatigue. 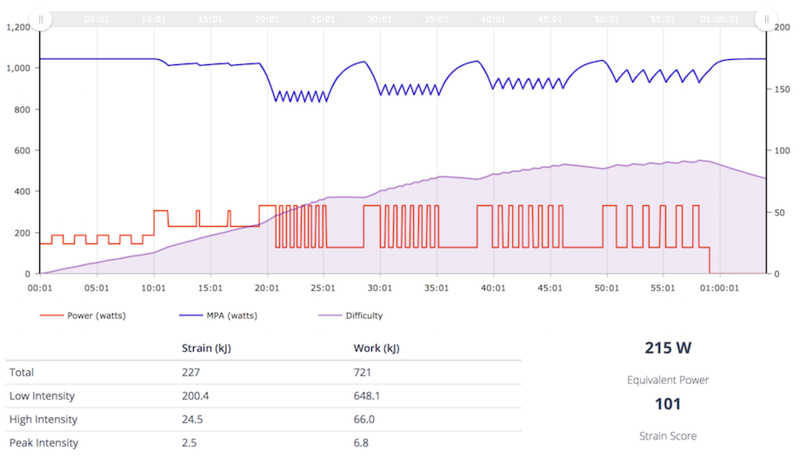 Over the final Peak phase, XATA’s prescribed intense workouts were mostly in the direct focus of Rouleur or 6-min power itself. My overall fitness did not really change much over this phase but, as with the whole idea of a Peak phase itself, the plan worked towards sharpening my fitness to match the specific requirements of the racing I would be doing. My final LTP and Fitness Signatures on P2A race day were 208 W and 1046W/18.4kJ/254W, with a Training Load of 97. This Positive Split Micro workout was a staple of my Peak phase, being right in my target focus of 'Rouler' or 6-min power, and also featuring lots of repeated surges just like in racing. I did three gravel races in April, each one drastically different despite being of similar 60-70 km length. Paris-Ancaster was a peak physical & mental performance for me. Times are impossible to compare due to the conditions always changing, but my dream target was top 200th overall in the >2,500 field. This would be a pretty challenging goal, as my previous best-ever placing was 263rd overall. But I did it, moving all the way up to 177th! What other things about training and about using XATA shone through this experiment? One lesson learned is that, the fitter you become, the harder the workouts that you can tolerate and complete. Xert ranks each workout in its database, and each of your activities, according to a Difficulty Score based on the rate at which you accumulate strain. These are ranked 1-5 stars, matching the 1-5 stars fitness ranking you have based on your Training Load. One of my favourite workouts that fit my desired focus of Breakaway Specialist is “Let the Sparks Fly.” Typically a workout with a maximum difficulty score of just under 100, it’s ranked as a 3.5/5 star workout in terms of difficulty. Throughout summer of 2017 and during my Peak training phase in March & April 2018, I could easily complete this workout despite its difficulty. However, early in training after 3+ weeks off the bike and travelling, I tried the workout December 30, 2017, two weeks after restarting training and with a Training Load of 60 (2 star fitness). As you can see, despite the workout wattages being much easier due to my lower fitness signature, I simply found the workout far too intense even in the very first set, and ended up bailing and just riding easy. Lesson Learned: Xert does a nice job of only recommending workouts that are appropriate for you in terms of difficulty. If you’re at a 2 star fitness, it’s not going to recommend workouts in the >3.5 difficulty ranking. The old axiom of “garbage in, garbage out” absolutely applies to proper training planning, either with or without power. When using power, one important keystone is to accurately and frequently set your fitness signature. Without this accurate fitness signature, you will either be doing workouts that are too easy – slowing your fitness development. Probably even worse is doing workouts that are too hard for your current abilities, leading to repeated failed workouts, non-functional overreaching, or injury. Traditionally, this involves doing 20-min threshold tests every 4 weeks or so. But I’ve always hated these, and I’m actually not really the type of rider who can do a good sustained 20 min effort. I know from past history that I’m much more of a TTT-type, thriving with hard pacelines featuring short & hard efforts with brief recovery bouts. A strength of Xert is that it makes frequent testing much easier, both indoors and out. Rather than requiring standard, steady-state efforts of different durations, Xert will automatically recalculate your Peak Power (PP), High Intensity Energy (HIE) and Threshold Power whenever you do a ride of sufficient intensity, indoors or outdoors. So whether you’re doing a hard Zwift race, a fast club ride/race, a set workout on Xert or other training platforms, all you have to do is ride hard once a week or so, and Xert will automatically adjust all future workouts based on your new fitness signature. For me, I have a favourite Tabata-esque workout that is guaranteed to reset my fitness signature. Each set consists of 13 reps of 30-s all out, with 15-s recovery at about 125 W. I find these easy to do both indoors and out, and it fits with both my preferred style of riding and my main focus on cyclocross racing. During summer 2017, my average watts can hit 270-282 W. In contrast, my average watts during our flat 15 km club TT is only about 250-255 W.
Here is an indoor effort that I did in mid-February. My Fitness Signature prior to the workout was 1003W/17.1kJ/243W. You see how my Maximal Power Available (MPA) with the blue line repeatedly fell below my actual power (red line). This tells Xert that the current fitness signature cannot explain the power profile. As a result, Xert automatically recalculates to determine a Fitness Signature that fits the power profile, potentially changing 1-3 of the PP, HIE, or TP parameters. In this case, PP remained at 1003W, but HIE rose to 17.3kJ and TP to 245W. To see what happens without an accurate fitness signature, if I did the exact same workout and power profile with my current fitness signature of 1043W/18.3kJ/253W, that same workout wouldn’t be nearly as intense, nor would it provide the same training stimulus. Lesson Learned: No matter what system you use, accurate and frequent updating of your fitness parameters is essential to ensure that your workouts are optimized to your abilities. Xert makes this frequent assessment super-simple and automated. I hope that you see the power and adaptability of Xert's Training Advisor. Day to day, it will adapt to your training history and your desired target, recommending training that will put you on that ideal path to a peak performance. Sign up for your free 30 day trial at baronbiosys.com. Check out our previous Xert articles discussing different fitness signature types and the unique analysis available through Maximal Power Available. Disclosure: Stephen Cheung is the Chief Sport Scientist for Xert and Baron Biosystems. Stephen Cheung is a Canada Research Chair at Brock University, and has published over 100 scientific articles and book chapters dealing with the effects of thermal and hypoxic stress on human physiology and performance. Stephen’s Cutting-Edge Cycling, a book on the science of cycling, came out April 2012, and he is currently co-editing a followup book “Cycling Science” with Dr. Mikel Zabala from the Movistar Pro Cycling Team. Stephen can be reached for comments at [email protected]news.com .